There are currently 8,532 users on this website. 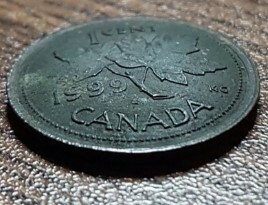 Someone has found a way to convex shape this coin with out destroying the strike, quite talented, probably if you weigh this coin it would be correct for a 1999 penny. Firstly - weigh the coin. My bet is that is has the normal weight of a 1-cent coin, or slightly lighter. Sunshine0274 get your coin weighed. 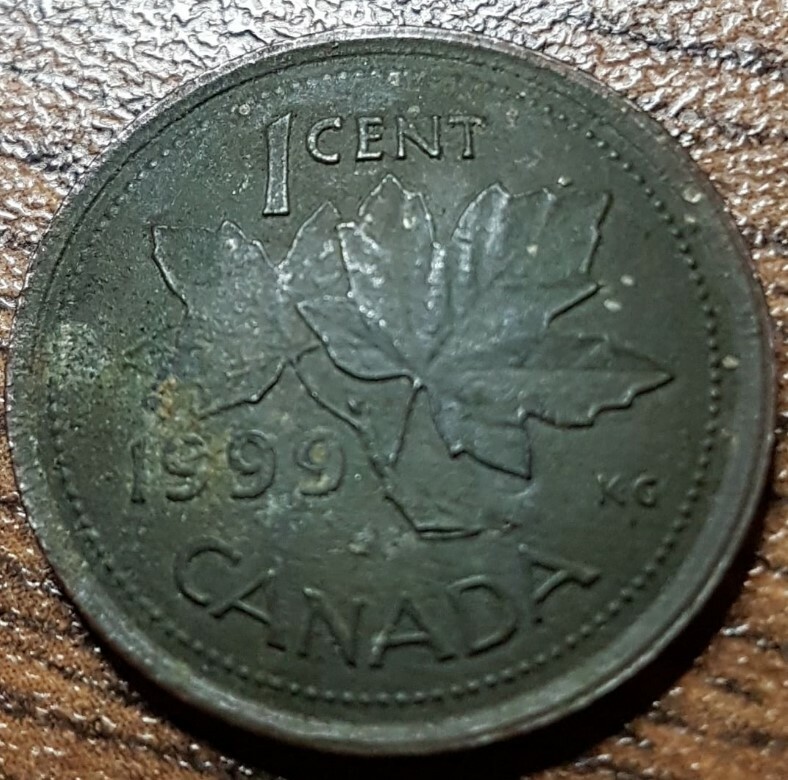 copper plated zinc 1999 penny. should weigh 2.25 grams. if your penny weighs more. I know of a possible match for another denomation. it would be quit and error. if it is that blank. that was produced for another coin. weigh will tell if it is that blank. if you dont have scales. go to the post office. they have calibrated scales. they usually dont wont mind weighing small objects. Sunshine0274 the flakes of metal. that are still on the reverse. what ever you do dont touch those specks. your coin was slowly heated. that is why it is concaved. see the copper plating is very thin. when the metal was heated over an open flame. once the metal starts to move. it will run off quite easly. hope this helps. but one can see. 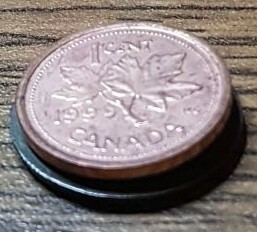 the 2 pennies dont match in size. get the weigh for sure. your coin was slowly heated. The fact that the copper is gone and zinc remains negates that possibility. See my comment above regarding "Texas Penny". 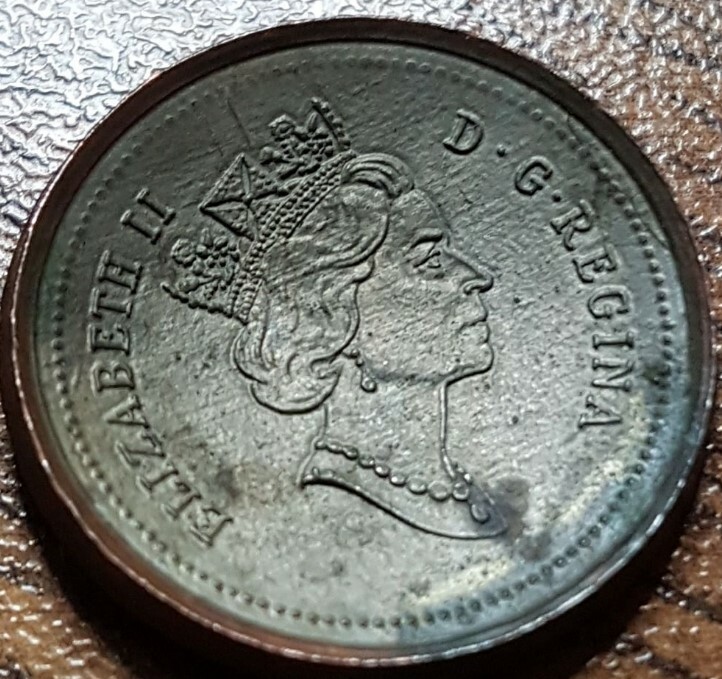 In other words, just a damaged coin. SPP-Ottawa thank you that crazy how that works. see if his zinc plank is the right weight. I see another metal possibly there. if it has the right weigh. in 1999 the Royal Canadian Mint produced so many of these blanks for a foreign country. when he posts the weight. this will verify. if it might be one of those blanks. the specks on the reverse would help to confirm this possibility. again thank SPP-Ottawa. if I had not watched this. I could not imagine this working so well. There is no way that can be a wrong planchet. 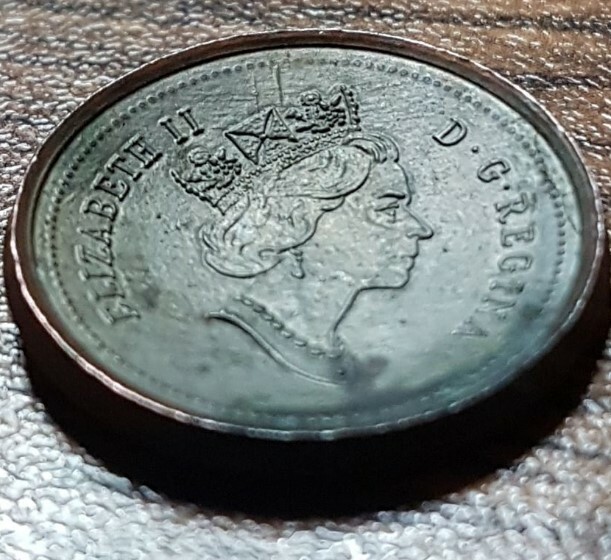 If it is larger, then how did it fit in the collar of the 1 cent. Also how would the devices increase in size. I agree with SPP with it being a Texas Penny or something similar. yes JimmyD I agree.but how would this blank be larger in diameter. I know jimmy you know your coins. as does SPP ottawa and alot more of the other members as well. myself I just like to learn. this coin is a good question. because it leads one to thinking. how would this be possible. the diameter was increased by being hammered. Found this photo of a "Texas Penny"
plating which has fallen off due to the pounding and stretching of the coin.